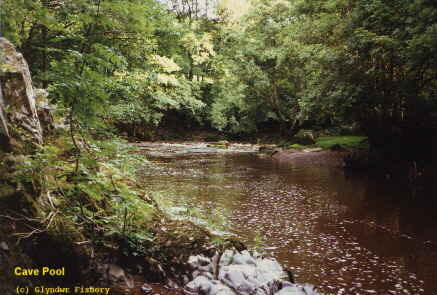 The Glyndwr Fishery on the River Vyrnwy is situated in unspoilt seclusion in the Welsh Borders at Dolanog. It is ideal for the discerning fly fisherman for whom the nature of his surroundings is as important as the wild fish that he catches, and for whom the ultimate delight is to escape from the mundane world and and lose himself in a day's fishing in a hidden valley of outstanding beauty. 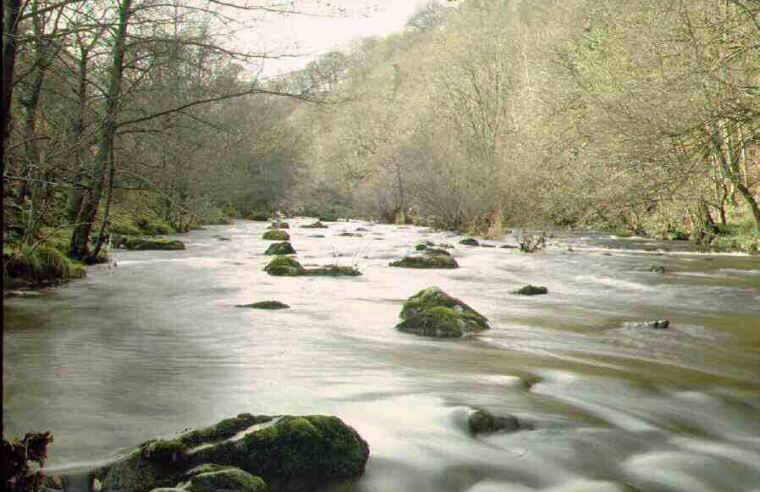 The Fishery is named after the scenic Glyndwr Way, part of which runs close to the river whilst it cuts down through a deep gorge and around natural outcrops with steeply wooded banks. Later it passes through hilly meadows and mature broad-leaved woodlands. 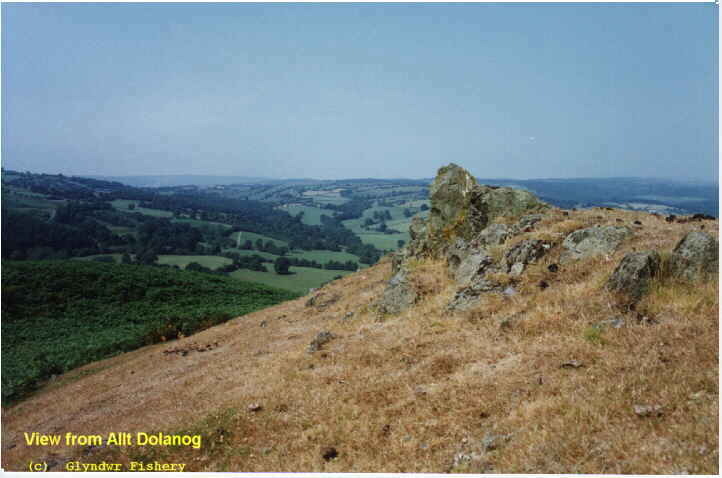 The waters extend for over two and a half miles downstream from Mill Farm, Dolanog, towards Pontrobert. 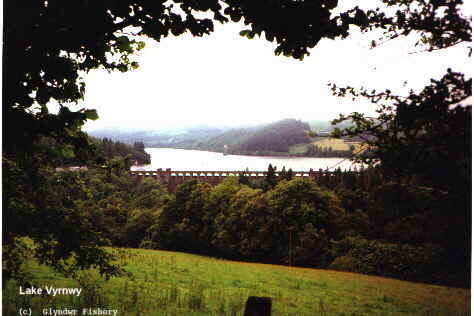 The river is fed partly from Lake Vyrnwy approx.10 miles upstream (L.Vyrnwy pic.2) , and is guaranteed a minimum acceptable flow all year round. This compensation water means that the river remains fishable in drought years when its sisters in the Severn catchment suffer badly. 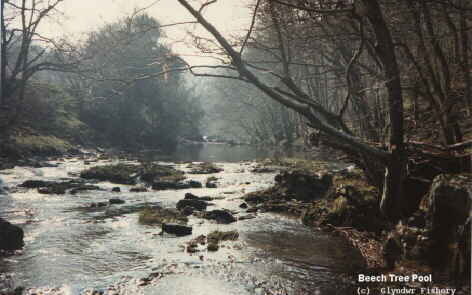 This stretch of the Vyrnwy is noted primarily as a trout river, and this section was the subject of a chapter in a treatise by Richard Threlfall as long ago as 1947. 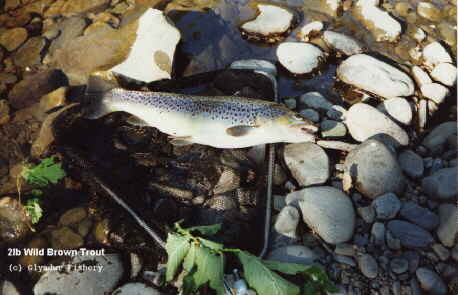 Wild fish of 3.75lbs and 4lbs have been taken on the fly in recent years, and the average wild brownie tends to run to a much larger size than elsewhere on the river. 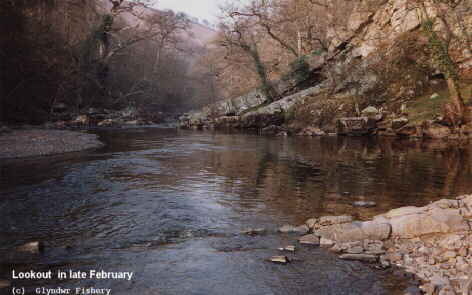 The weir at Dolanog is recognised as being the upstream limit for salmon, and the fishery contains a many good holding pools, although in most recent years the salmon have tended to run right at the end of the season. There is also very good grayling fishing. Fishing is by Fly only, unless prior authorisation is obtained from the fishery manager for alternative methods at certain specific times. map of the fishery is provided with each permit. There used to be a girder bridge below the weir at Mill Farm, Dolanog which marked the upstream boundary of the top beat. Unfortuantely it was washed away in floods. 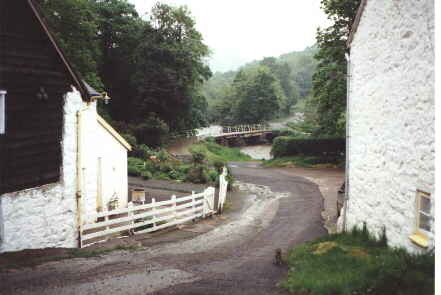 There is now only a small lay-by marking where the bridge used to cross the river to the farmhouse and mill. This is still shown on most satnavs! 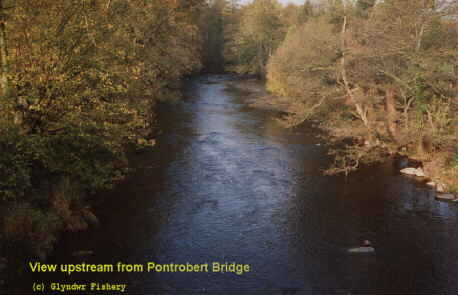 The lower end of the fishery is best approached from Pontrobert, by taking the Dolanog and Llanfyhangel-yng-Ngwynfa road north of the river. The lower end of the bottom beat begins on the left side of this road, upstream of the waterfall. This is at the upstream end of the Fishery, and begins as a single left bank stretch directly downstream of Mill Farm, where there is still evidence of a road crossing the river before floods destroyed a girder bridge. It runs for approximately 215 yards down to the first bend. 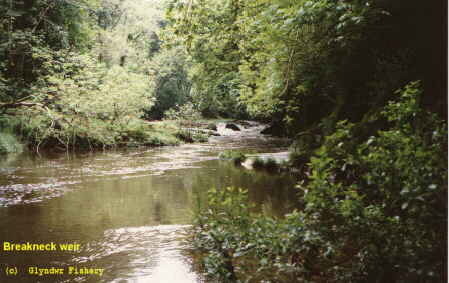 Here the fishing becomes double bank and extends a further 400 yards to the end of the first beat, where a small burn runs in on the right bank. 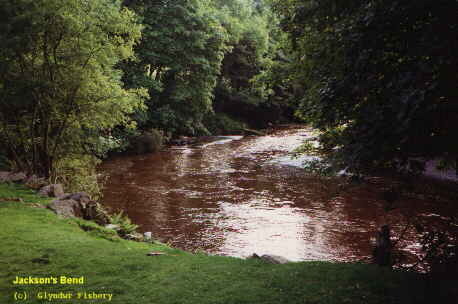 It is a very attractive stretch comprising a series of deep holding pools, notably "Sheepwash", "Cave", "Campers" and "Lookout", with fast rocky runs in between. Access to the left bank is at Mill Farm. 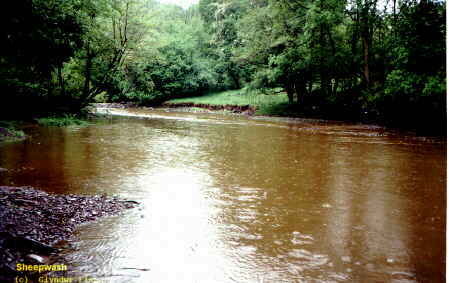 The right bank can be accessed on the bend of the river where there is parking in a lay-by beside the road. 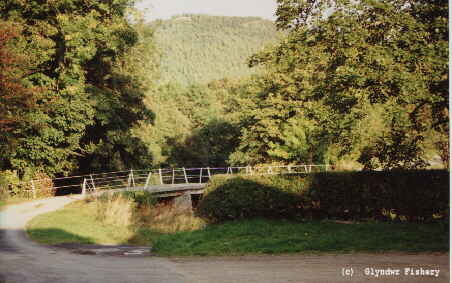 Here is the beginning of the Glyndwr Way which runs close to the river and provides access to the fishery all the way down to the bottom of beat 3. 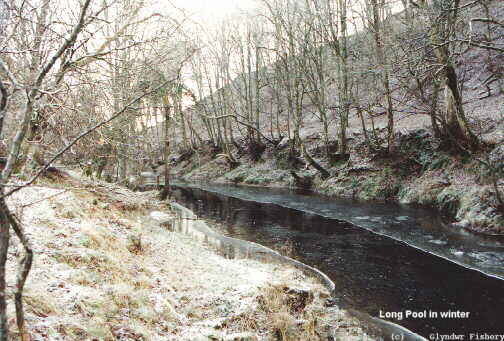 This is left bank fishing directly downstream of Beat 1, as the river runs through a steep gorge. 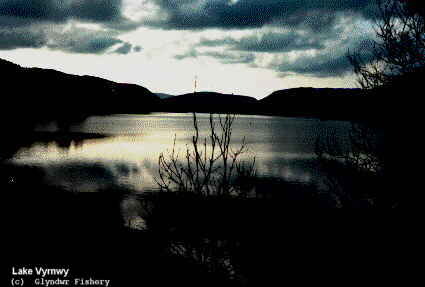 This is spectacular scenery and provides exciting but challenging fishing. 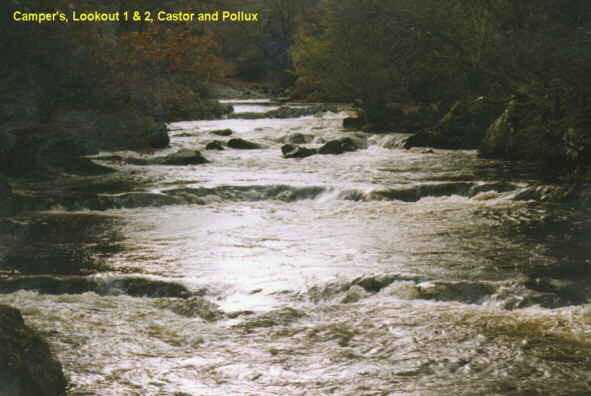 The rapids and deep pools of the top part (eg "Castor" and "Pollux" and "Long Island") are relaced by by wider flats and glides (eg "Holly", "Beech Tree", "Long Run" and "Jones") which are generally good holding water for both trout and grayling. 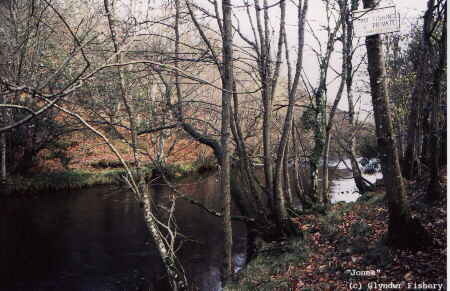 The stream, Nant Dolwar, which enters under the timber bridge on the left bank marks the division between beats 2 and 3. This is double bank fishing for about 750 yards. 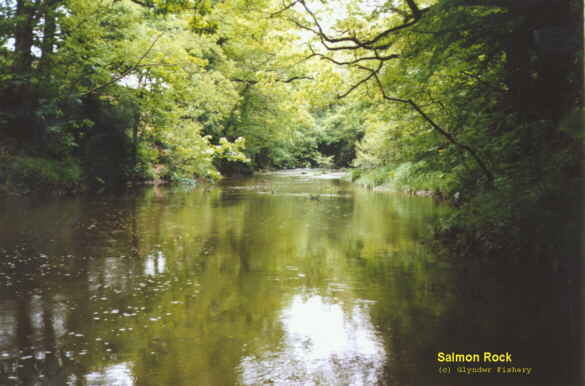 The river is quieter through most of this section, and the left bank opens out into a meadow for most of its length. There are two particularly large and very deep pools in this section, "Cottage" and "Long Pool", which always hold a good head of fish. The end of beat 3 and beginning of beat 4 is marked by the fence at the end of the meadow on the left bank. There is a stile some 30 yards up from the bank. 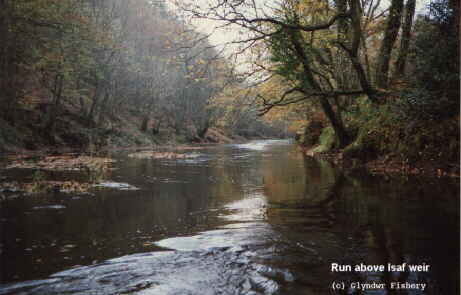 This is nearly 1500 yards of left bank fishing, running through woodland. 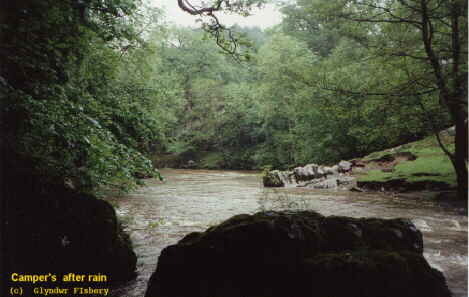 It is wider in places with gravelled flats and deep pools, including "Gwern Fawr" and "Isaf" pools: the latter is below a rocky weir, with a long gutter and runs above. The junction of beats 4 and 5 is where a small waterfall runs into the tail of a pool just as the road joins the river on the left bank. This is again left bank fishing. 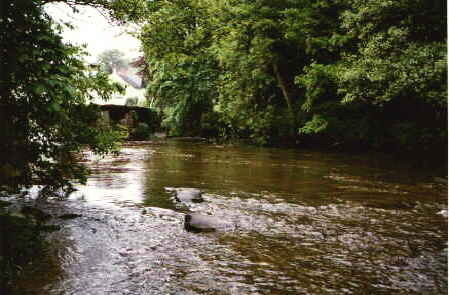 The road runs alongside the river for the whole of this beat, and there are numerous places to park on the verge. 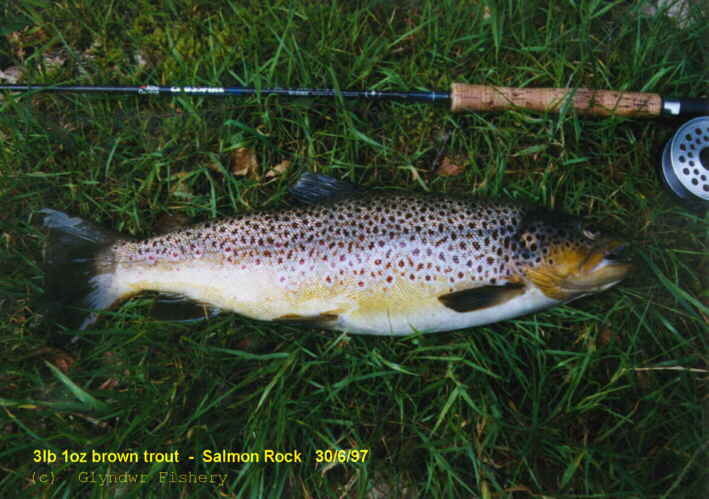 "Salmon Rock" produces individual large brown trout (2-3lbs) every season. 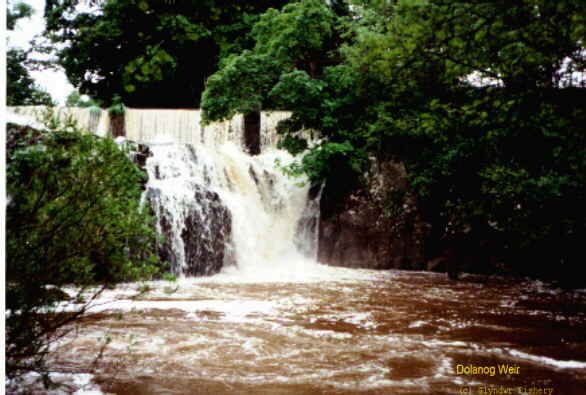 The succession of glides below "Breakneck Weir" also provide ideal habitat for large brown trout and grayling. 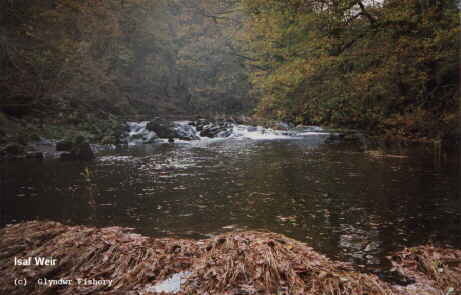 The fishery ends on the corner where a smaller tributary runs in uder the road. 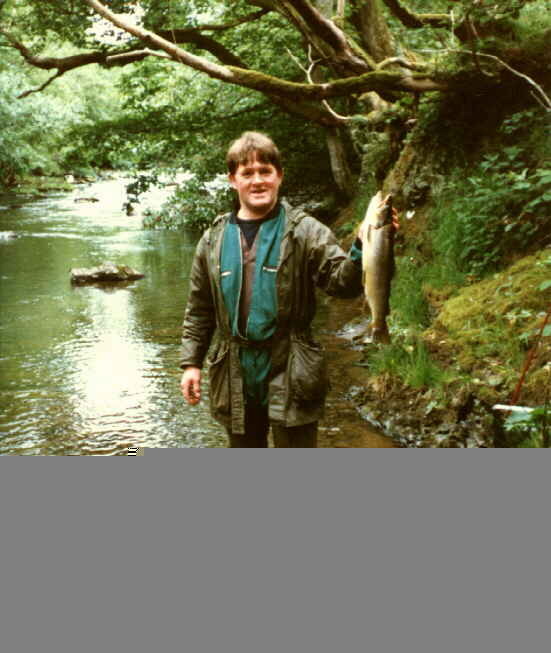 Trout in this fishery are generally much larger than in most of the rest of the Vyrnwy. They also tend to be more wary and difficult to catch. I have found that upstream fishing together with a stealthy approach using the banks for cover brings about decidedly better results than traditional downstream wet fly methods. A casual approach rarely brings any success at all. A fairly light fly line AFTM 3-5 with a cast tapering to 1.5-2lbs at the tip is best. Flies tied on size 14-16 hooks most frequently bring best results, although a 12 will be accepted in high flows or when there are mayflies on the water, and 18-20 Mike Weaver Black Gnats are good both early and late in the season. Iron Blue, Iron Blue Variant, Copper Ribbed Hare's Ear, Tupps, GRHE and Furnace Hackle (All these fish well at times especially if the hackle is not over thick, but is tied palmer style down the body). Red Sedge 12-14, Grey Sedge 14-16...Grey and red sedges fish well in hot weather. In late summer a lightly dressed size 20 blue hackle may be best if there are caenis on the wing. March Brown with Silver, Spiders, esp. Partridge & olive, Partr & Orange, Peacock & Black (this latter tied on a #12 may imitate a toad tadpole in summer), Peacock & Coch-y-Bonddu hackle. 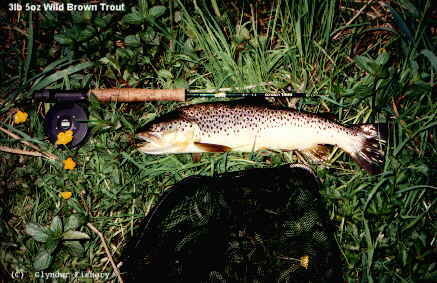 Hans van Klinken caddis fish well in running water in the reduced flows of high summer. Once again flies should be lightly dressed. Grayling will also take most of these flies at differing times. 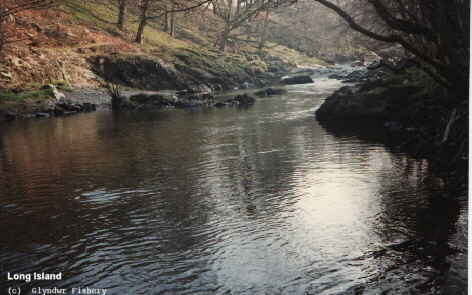 Wading is often necessary, but can be hazardous owing to the very slippery and uneven rocks. 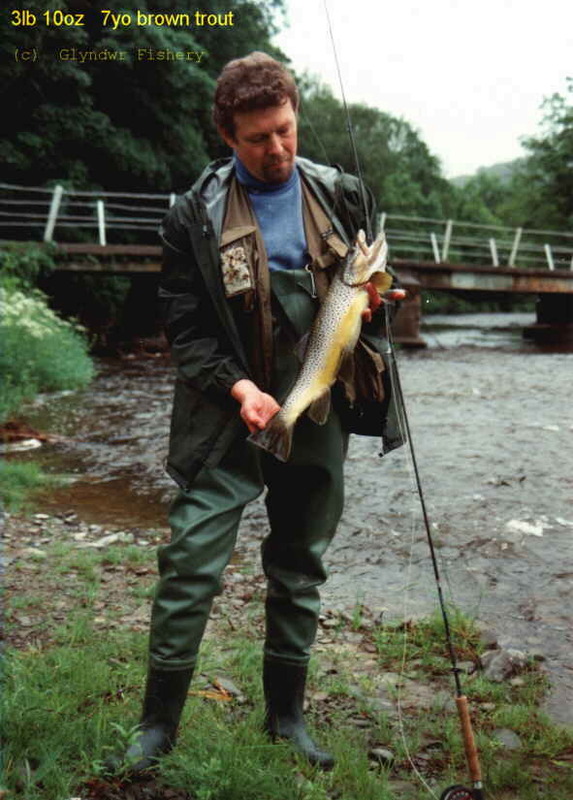 Felt-soled or studded waders should be worn, and a wading staff used where appropriate.